(Nanowerk News) Traumatic brain injury is currently revealed by using a series of physiological and cognitive tests along with standard medical imaging, such as magnetic resonance imaging (MRI). The techniques are excellent for diagnosis of moderate to severe traumatic brain injury, but less effective for diagnosing mild injury and for predicting the extent of its impact. When approaching the problem from an engineering standpoint, one element missing from the diagnostic tool kit is the ability to detect signs of brain injury at the molecular and cellular levels. Biomedical engineer Sarah Stabenfeldt has received the National Institutes of Health Director’s New Innovator Award to support her work to develop such molecular tools. The award is designed to support creative investigators who propose innovative projects with high-impact potential. Stabenfeldt is an assistant professor in the School of Biological and Health systems Engineering, one the Ira A. Fulton Schools of Engineering at Arizona State University. Biomedical engineer Sarah Stabenfeldt has received the National Institute of Health Director’s New Innovator Award to support her work to develop a tool kit with the ability to detect signs of brain injury at the molecular and cellular levels. More than 1.7 million people in the United States sustain traumatic brain injury each year, according to the Centers for Disease Control and Prevention. Stabenfeldt has been studying possibilities of using nanoscale devices for enhanced detection and treatment of brain injuries ranging from mild to severe. She is exploring the use of engineered nanobodies for this purpose. Nanobodies are therapeutic proteins derived from antibodies that contain structural and functional properties of naturally occurring antibodies. Antibodies are proteins produced by plasma cells that are used by the body’s immune system to identify and remove or neutralize harmful bacteria and viruses. Her goal is to develop a nanoparticle system decorated with nanobodies that can be introduced into the bloodstream as “targeting probes” that have the ability to locate the molecular and cellular source of brain damage. Stabenfeldt describes the probes as similar to balls with Velcro or suction cups on them, facilitating the nanoparticles to attach themselves to the injured areas in the brain. Once attached, they would then serve a multitude of functions ranging from diagnostic contrast agent for medical imaging to delivering doses of medicinal drugs to the area – drugs that would jump-start the healing process. “The ability of nanobody probes to recognize the complexity and severity of neural injury to the brain at the molecular level has the potential to significantly impact diagnostic and therapeutic approaches for traumatic brain injury,” Stabenfeldt said. The project is a complex undertaking that will require a range of biomedical and technical skills. 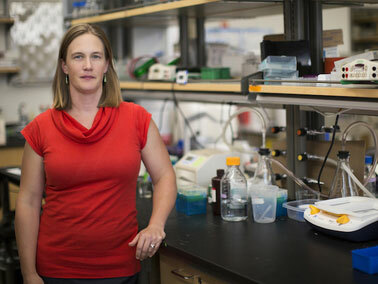 The National Institutes of Health likely considered the diverse expertise of her colleagues in the Fulton Schools of Engineering in deciding to support her research, Stabenfeldt said. She will be collaborating with three fellow faculty members: assistant professor Vikram Kodibagkar, associate professor Jeffrey Kleim and professor Michael Sierks. She will also work with medical professionals at the Barrow Neurological Institute at Phoenix Children’s Hospital: Dr. David Adelson, director of the institute, and Jonathan Lifshitz, director of the Translational Neurotrauma Research Program. The grant is providing $2.3 million to fund her work for five years. Beyond covering laboratory expenses, it will enable Stabenfeldt to provide biomedical engineering doctoral students opportunities to assist in the research.